Here is the latest from my easel. 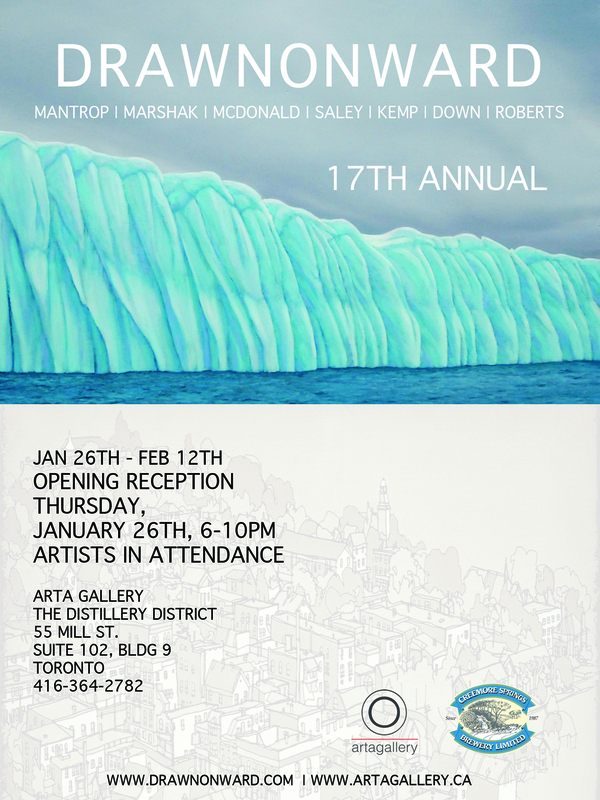 It coincides not only with my decision to join the stable of artists over at Roberts Gallery on Yonge St. (Downtown. Big time, Ma! ), but also with a most bizarre political episode south of us. Somehow, since high school, whenever Yonge St. is mentioned I can’t help but picture John Candy, Joe Flaherty and Andrea Martin walking down Yonge St. in a scene from SCTV’s ‘Garth and Gord and Fiona and Alice (a Canadian film)’. These honest and naive east coasters just can’t make it in Toronto! Classic. Comedy is the best thing I can offer on a strange, already surreal day like today. The jesters can save us! Comedy is God. Art is comedy. Comedy is art. Art is God. Or whatevs…. While I’m sharing yonge St. themed classics from SCTV Here is another gem featuring the longest street ever. Watch ‘Midnight Cowboy 2’. John Candy and Eugene Levy stroll down Yonge St. as a wanna be hustler and pimp pairing. It is completely classic and can’t fail to brighten your day. And here is my offering. Hopefully it won’t make you laugh. A commissioned painting of the 401 building. One Night Only Art Show… For the children. I was lucky enough to go to summer camp from grade 6 to grade 11. The Durham Board of education ran a ten day art camp in the wilds of Haliburton and it was amazing. It was also affordable because it was so short. It gave me a window into a world that I barely knew existed, save several educational viewings of ‘Meatballs’, the classic Bill Murray/Chris Makepeace buddy movie (which, as it turns out was filmed at the very camp of which I now speak/write). The art camp took over Camp White Pine before ‘real’ camp season started in earnest. What made it so special, I think, was that everyone there, from grades 6 to 12, was art interested and selected for this great experience for their artistic achievements in school. Art classes of all sorts ran all day interspersed with sports. I did some cartooning and then went sailing, I sketched in the woods and then popped over for some archery… Tennis, then sculpting. Awesome, right? I ended up a being a counselor a la Meatballs, and although our particular yearly camp life was short, it was fun. Damn fun. Super damn fun. I remember looking at the names scrawled on the walls of the cabins, repeated in different color pens, sometimes marking several years of attendance. Those were the real campers. They were there for a whole summer. Every summer. That seemed amazing to me. It was like an unseen subculture had revealed its existence to me through these yearly notations on the walls. I was and am glad to have had the experience of summer camp. I loved everything about it and it was part of shaping me. Summer camp may seem like a luxury, and it certainly is in a lot of ways, but it shouldn’t seem inaccessible for children of less moneyed families. 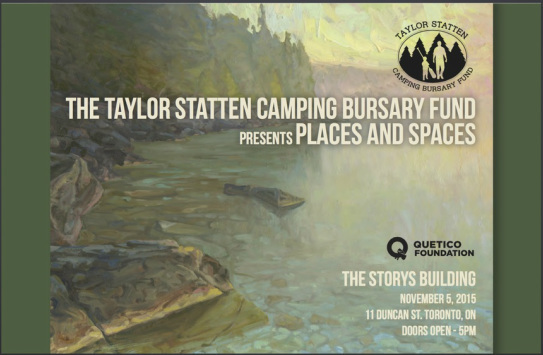 For several years running I have been a part of a very cool art show that helps to send young campers to the incredible Taylor Statten Camps in Algonquin Park. This years show is this Thursday night. If you can make it out, please come and help us give some deserving youths an experience of a lifetime. I have some new works appearing for the first time here. Here is one of ’em. Collective Horizons show… One Night Only! As it turns out, art is good for your brain. Neurobiologist Semir Zeki did an experiment in which subjects viewed various works from famous painters. Some were found to be pleasing while others were perceived as “ugly.” Zeki did brain scans and found that increase in blood flow was directly proportional to how well-liked a painting was. Viewing art that you really love is like falling in love, chemically speaking. And art can, according to recent research from Germany, delay or negate age related decline in brain function.. Ok, ok, that study was about making art, but still.. Art helps us live better lives. Simple. Now that spring has sprung it is high time to get the blood flowing through your brain to whatever areas needs work after some prolonged winter drudgery. So, forget about Sudoku for a night and come see new work by 4 painters who all work full time to bring happiness to your brains through your art-hungry eyes. Collective Horizons will be showing new work for one night only. PLEASE VIEW THE ATTACHED INVITE FOR DETAILS. Hope to see you and your art lovin’ brains there. Come out and join us for a great night of art and friends. Not many artists consider kayaks, snowshoes, skis, hiking boots and backpacks essential tools of their trade. 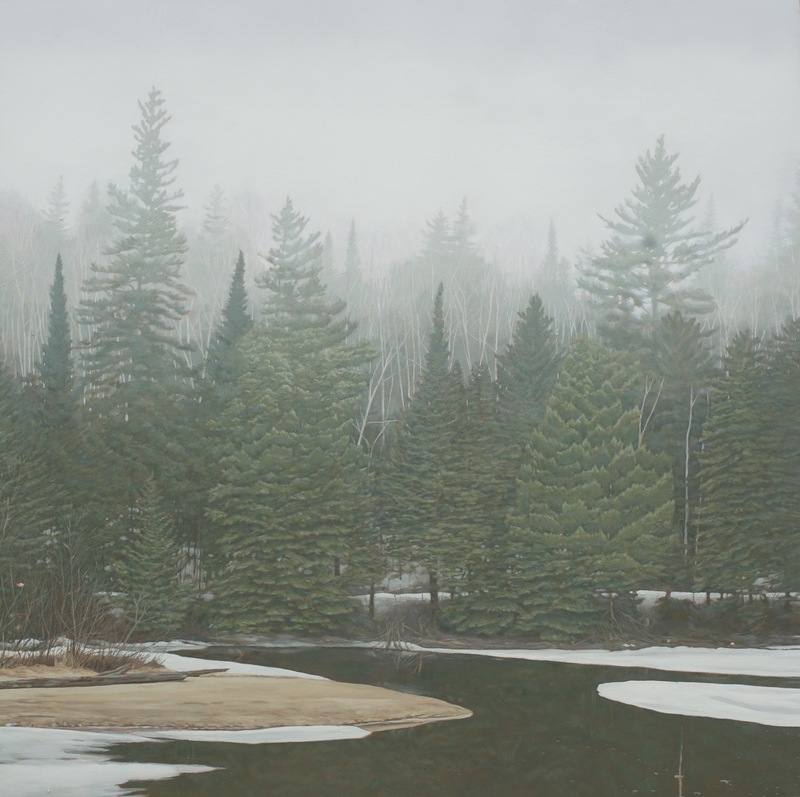 But then, not many artists travel by ship, school bus and canoe over 100,000 kilometres to try to capture the wild beauty of the Canadian landscape on canvas. 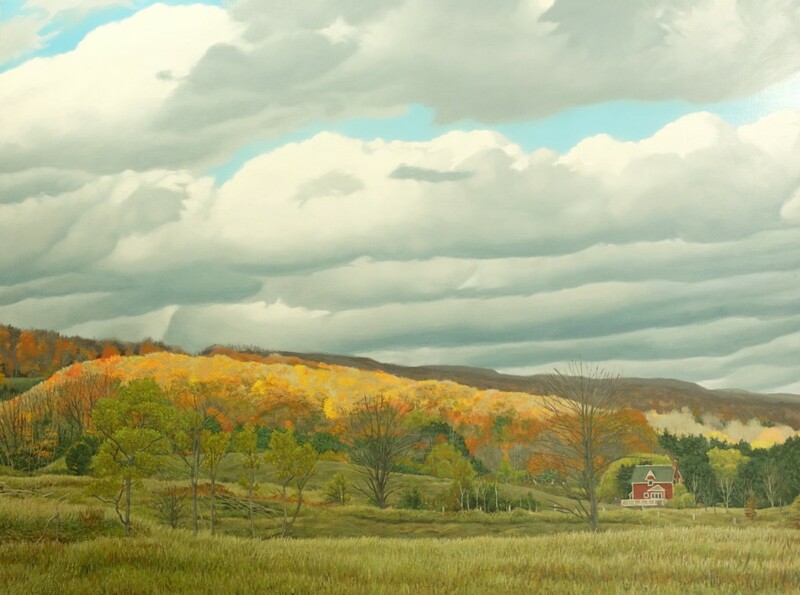 Unless they are the seven painters with the Canadian artists’ collective Drawnonward, who have spent almost 20 years exploring the length and breadth of Canada pursuing their dream: to paint Canada. It was a dream whose genesis lay in the camaraderie and creativity of their days at Canada’s largest boys’ school, St. Andrew’s College in Aurora, Ont., where five of the seven members of the collective attended school in the late 1980s. There, Paul Mantrop, class of ’87, Christopher Roberts ’87, Gordon Kemp ’88, Steve McDonald ’88, and Robert Saley ’89 honed their artistic skills and bonded over shared projects. After graduation, the five stayed in touch, with Mantrop, Saley and McDonald going on to attend the Ontario College of Art and Design. But it wasn’t until their first trip together, a two-week canoe trip along the Montreal River in 1994, that the idea for a collective was born. It was on this journey that everyone really clicked and realized the potential of working together, says Mantrop. Since then, the five SAC alumni, along with David Marshak and Jeremy Down, have travelled more than 100,000 kilometres together, to three of Canada’s coasts and explored much in between. St. Andrew’s was instrumental in developing the collective’s strong bond, says founding member Mantrop, who is still active with the school, visiting and donating art at charity events. Their travels have taken Drawnonward (note the clever palindrome) to Haida Gwaii and Vancouver Island in British Columbia. They hiked the northern stretches of the Yukon and the Dempster Highway, traversed the icy slopes of the Gaspé Peninsula, sketched in Quebec’s Eastern Townships and cruised on a Russian exploration vessel around Newfoundland and the far North — and they’re not finished yet. “Having the opportunity to travel across this vast country you get this really nice mental map of the place and the people who live there, you become fervently nationalistic and often stand back and think: ‘Wow, what a country we live in,’ ” Mantrop says. Fellow Drawnonward member McDonald shares Mantrop’s wanderlust. St. Andrew’s College is proud of the collective and many of the artists’ paintings decorate the school walls. Tino Paolini, head of the school’s visual arts department and a faculty member for more than 30 years, taught all five former pupils. “There were five wonderful kids and we have done our best to celebrate their achievements,” he says. “St. Andrew’s was one of the many stages for them to become successful artists. We are very lucky to have them as alumni and we are proud that they see our school as having played some sort of important role in their education,” he adds. The collective shows no signs of slowing down or disbanding. Next summer the group will be off again, to the Northwest Territories for a trip down the Nahanni River. Drawnonward will exhibit this fall at the Creemore Festival of the Arts from Sept. 21 to 23, and at the Evergreen Brickworks Sept. 27. Well it has been quite a bit of time since I have updated my blog. So far I would not say that I am a rockstar blogger… It is a routine that so far has eluded me. I am determined to (through determination doncha know) perservere through my fits and starts and approach this as part of my weekly rituals… Of which I think I have very few, soooo.. Should be easy peasy. My Son Wyn is now almost a year old and we are having so much fun with him around. He is quite a little light this guy, and there is no shortage of inspiration and creativity in the air. We are almost constantly in a state of renovation here too.. Just int he last week we have ripped out a wall and put in a new kitchen! Miles to go before we sleep though… More flooring is next…. I’ve got some exciting things happening painting wise this fall as well… Drawnonward will show our newest work in the Creemore Festival of the Arts from September 21 to 23, something we are very happy about as it will be our first show in the area in several years. Another Drawnonward event is only a week later in Toronto. 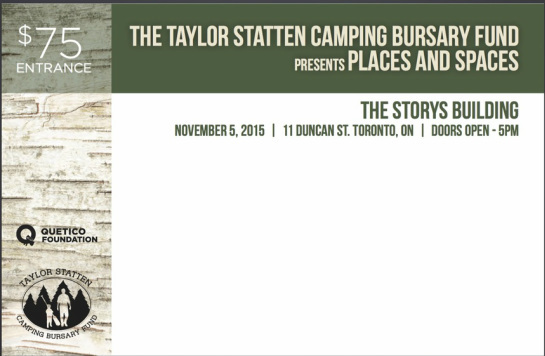 This is the 3rd annual art show in support of the Taylor Statten Camping Bursary Fund. Drawnonward and several other artists put on a great art show with music, food and drink to boot. A portion of the art sales go towards the bursary fund. It has really turned into a great event so come out if at all possible. On top of the Drawnonward events, I am preparing for a quick trip to Newfoundland to get some ocean air in my lungs. 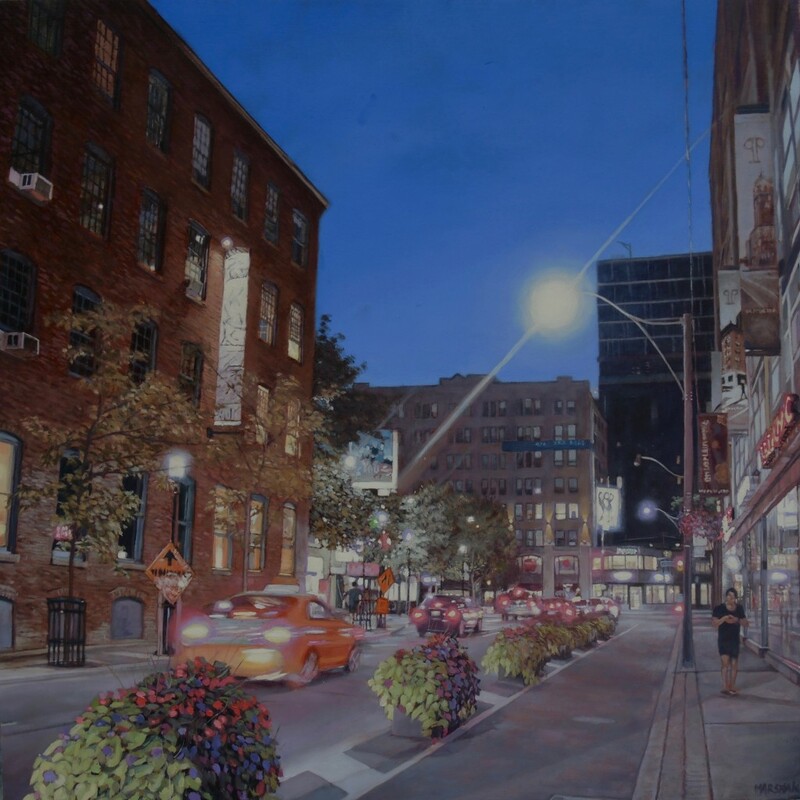 It will be a quick visit but I am hoping to come back with some great reference for a series of urban St. John’s pieces I’ve had in my head for awhile… I hope to be showing again in St. John’s before too long. Also I have got a piece placed in the Elgin Theatre during the TIFF madness.. They expect 30,000 people through the space during the festival so that is some great exposure to very wordly crowd. Rupert Young is behind that particular bit of canoodling. He has also secured me some wall space for a solo exhibit in November. Because of the suprise element to this outing, I will be showing a collection of paintings that I have show once or twice already, rather that all new work, which would be impossible before November. I think I’ll call it ‘Recollection’…. What else… My lovely and awesome wife photographer Sarah is in the Queen Street Art Crawl this coming weekend. She is doing such great stuff and I think people are going to love it.. Get out to Trinity Bellwoods park if you can and check it out.